Hey my sweethearts! Here I am again with another Friday pattern feature. These patterns are not created by me, but by other very skilled and creative crochet artists who offer some of their hard work for free use! 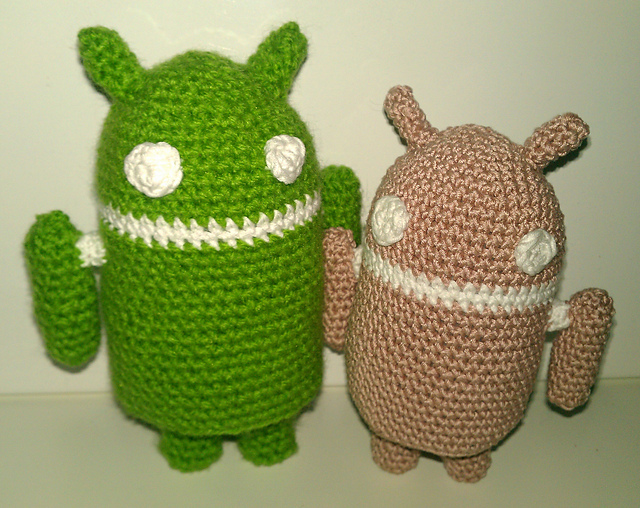 Since I have become a big fan of android phones, how about a cute android amigurumi pattern? These guys are quick and easy to make and would be a great companion for those who would love to hug their android devices but find them too rigid, here’s the perfect hug alternative! This entry was posted in Blog, Crochet and tagged android, crafting, creative, crochet, cuddly, cute, device, download, feature, free, green, ideas, pattern, patterns, robot. Bookmark the permalink.